Devious Tales is my new collection of short stories consisting of 12 dark tales with a twist. It’s available as both an e-book and a paperback from Amazon and as a paperback from CreateSpace. The paperback edition contains two bonus stories. Check out the summary below. Holcomb Bridge has been a secluded and romantic make out spot for the local teenagers for many years, but that changed one late night. Photographer Derek Shaw’s life changes in both good and bad ways after he meets Karen, the new love in his life, and her two kids, Gerald and Amanda. Some people like working the over night shift. Others need to. It gives their demons and nightmares a place to escape. Love, even in old age, can take an unforeseen turn. Judy was perfect…well almost. She did have one little problem. For young Bobby Smithfield there are some lessons you never recover from. A bad marriage and an organic garden make for a delicious mix of ingredients that will make your garden grow. Office romances can be great; they can also be bad. However, sometimes it’s just what you need when your life is about to take a deadly turn. As Brad Hollis discovers, surprises do not always turn out quite as you anticipate. Young Billy Atwood becomes friends with an old man who lives in his apartment building. Their relationship is short lived, but for Billy there’s an unexpected twist of fate. The holidays can brings out the worst in everyone, and does in this Christmas treat. Can old lovers come back and haunt you? Well, not if they are dead…or can they? Follow me on my Facebook page, John Greco Photographer/Writer. All you have to do is click right HERE. I am also on Twitter as johngreco10. E-mail me at John.twentyfourframes@gmail.com. In the subject line type Book Contest. Provide your email address. I will send you a PDF file that can be downloaded to your PC, I-Pad or other device, along with a JPEG file of the book’s cover. I strongly encourage you to write an honest, and I do mean honest, review and post it either on Amazon, Goodreads and Blog if you have one. All three would the best scenario. That said, the recipient is not obligated to write a review, but hey, that’s why I am sending you the book. If you do have a blog and write a review, please send a link back to me. Devious Tales: 12 Short Stories is now available as a paperback! The paperback version includes two bonus stories. 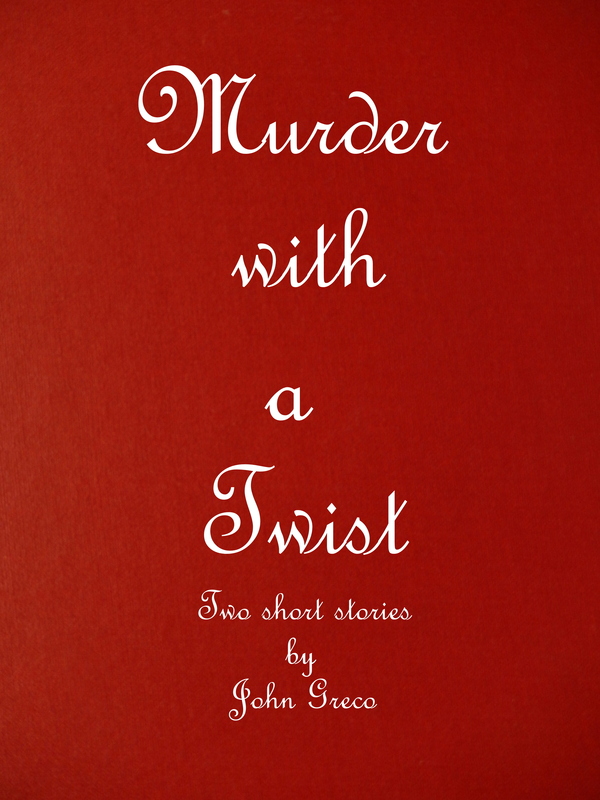 Both were previously published in Murder with a Twist. You can get you copy here at CreateSpace. It will also be available on Amazon in a few days. The e-book is now available here at Amazon. I find inspiration can from anywhere and at any time. Many times it happens when you least expect it. For Life Lesson, one of twelve short stories in my new e-book, Devious Tales, it came from the above photograph I took back in 2015 in Vermont. My wife and I did a photographic road trip that began in Burlington. From there we made our way to Woodstock, St. Johnsbury and eventually back to Burlington; making multiple stops to photograph what caught our eye along the way. One day during this road trip we found ourselves on a dirt road. Instead of turning around, we decided to see where it would lead. There was actually little to see or photograph except for this old boarded house. I took a few photos from different angles and we went on our way. The house intrigued me. I wondered who built it way back in 1924? Why in the middle of nowhere? Who and how many people have lived here since? What happened to them? It all stayed buried in my head. As the idea for Life Lesson began to take root, this house was the image that suddenly appeared in my head, and where most of the action in the story takes place. Like any creative individual does, no matter what form your art takes, you observe, you listen and you store away information into a mental or physical file for possible future use. That’s where it remains, waiting for that spark of creative juice to bring to life something new. You can read Life Lesson and other short stories in Devious Tales. Currently, available as an e-book on Amazon. Click here. It will soon be available as a paperback. More on that later. Pigeon Point Lighthouse is located along the Pacific Coast Highway about 50 miles south of San Francisco. It’s style is very much in line with the look of the lighthouses in New England. Another sunset photograph. This one is local. Ozona is a small coastal community located in Central Florida’s Pinellas County. You can see more of my photography by clicking on John Greco Photography.